One day, Joseph’s brothers traveled to a distance to feed the flock in Shechem. And the man said, “They were here a moment ago. 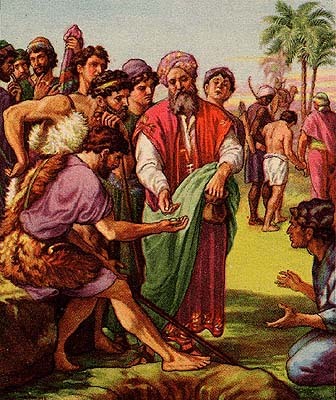 I overheard they said, “Let us go to Dothan.”” So Joseph traveled to Dothan to find his brothers. When Joseph’s brothers saw him from a distance, they plot with each other to kill Joseph and then throw his corpse into a pit. So when Joseph came near his brothers, they stripped off his colorful coat and threw him into a dry pit.Then Joseph’s brothers sat down to eat. The brothers quickly pull Joseph up from the pit. They then sold Joseph to the Midianites for twenty shekels. When Reuben returns to the well to save Joseph, he couldn’t find Joseph as Joseph was no longer there. Joseph’s brothers took Joseph’s coat and tore it into pieces. They killed a young goat kid and dip it in its blood. Then they show their father, Israel, the tore pieces of Joseph’s coat which is dipped with blood. And their father was so sad and wept for Joseph. When the Midianites arrived at Egypt, they sold Joseph as a slave to Potiphar who is the captain of the guard.